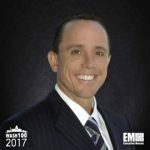 Executive Mosaic is glad to announce KBR‘s incoming Chief Financial Officer Mark Sopp as an inductee into the 2017 Wash100 — Executive Mosaic’s annual selection of the government contracting arena’s most influential voices. Sopp will transition into the CFO role at Houston-based engineering services contractor KBR during the first quarter of this year and joins the company in the midst of efforts to grow government services revenue and diversify the sales mix after the closure of $870 million in acquisitions during 2016. KBR acquired Wyle in August for $570 million and subsequently added the former Honeywell Technology Solutions business in September for $300 million to create a standalone $2.5 billion government services segment named KBRwyle. KBR expects government services revenue to represent nearly 41 percent of total annual sales from 2017 onward. Sopp is a three-decade finance veteran who previously spent 10 years at Leidos as its CFO until his mid-2015 retirement and prior to that held the same role at the former Titan Corp. for seven years. “Along with his extensive financial and capital markets expertise, Mark’s long-time experience in the government contracting sector, including knowledge of the government services investment community, will be immensely helpful as KBR expands our government services segment to achieve better balance between our government and hydrocarbons businesses,” KBR CEO Stuart Bradie said in December upon Sopp’s appointment. “The addition of KBRwyle has brought a large number of reimbursable professional services contracts to our portfolio and we are seeing continued expansion of existing government contracts and task orders for the U.S. and U.K. governments,” he added. Sopp helped steer Leidos through its initial public offering in 2006 when the formerly employee-owned company was known as Science Applications International Corp. and subsequently helped lead SAIC through its 2013 split into the two independent, publicly-traded contractors now known as Leidos and SAIC.